Board games are a big part of our lives! We play them often as a family or with friends – in fact, about twice a year we have a “Board Game Day” in our home, inviting friends of all ages to play board games together all day and into the night. We also incorporate board games into our homeschool day. I believe that they are all educational board games – there is something to be learned from any board game. I often tell people that if I had an unlimited income, I would teach using nothing but board games! It would be possible to have a game for every topic and every subject. When thinking of board games, most people are familiar with Scrabble and Monopoly, but there are so many more out there! Monopoly – buy, sell, trade, taxes, etc. Civilize This – a trivia game with Ancient, Medieval, Renaissance, and Modern categories. Mancala – ancient game from the Middle-East. Don’t Quote Me Sports Edition – quotes from famous athletes. Blood Bowl – football, but with a violent, fantasy twist – deals with probability and geometry. The Hobbit – work together to steal all the gems from Smaug the dragon – work with probability, exercise your memory, recitation, etc. Any game from Family Pastimes – great educational, co-operative games for all ages. Yes, the dreaded S-word! Almost any board game involves socializing with others. The ultimate in board game socializing is The Great Canadian Board game Challenge which is held across Canada and which we sometimes participate in at our local convention, Hal-Con. Say Anything Family – your children have to think about how OTHERS think and feel. Scene It – original, kids, or any of its many variations – enjoy movie clips while exercising your spatial, memory, and observation skills, while laughing together. Choose a game about the place or time you’re learning about to enhance your homeschool studies. Trivia games can be used as a review of what you’ve learned. Are you trying to teach something specific that you would like to find a board game for? The most comprehensive list of boardgames anywhere is at www.Boardgamegeek.com. You will even find reviews of the games so you can decide if you would like to purchase or not. 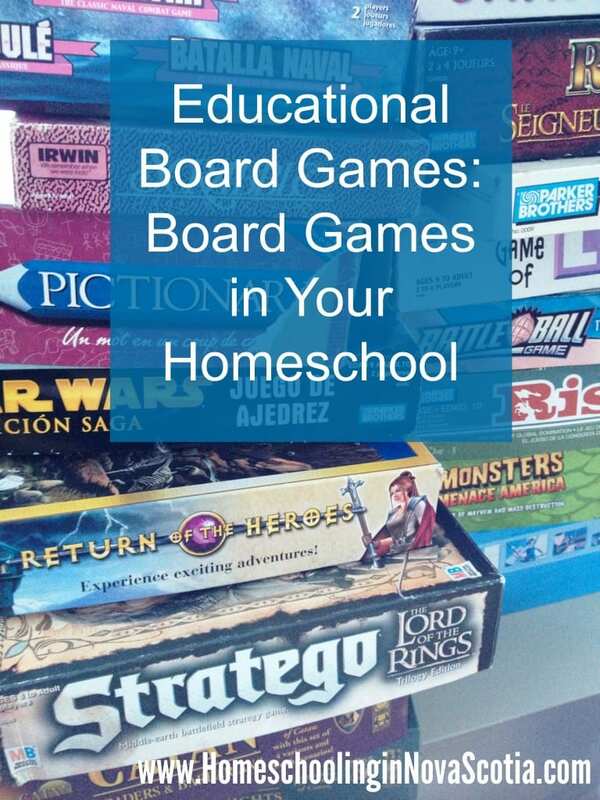 What are your favourite educational board games in your homeschool? Have your children ever made their own board game? Previous Post Fibre Friday: Let the Ravellenics Winter Games 2014 Begin! Next Post Fibre Friday: One More Week to Go! Great list of games to play that have educational value. Look board games especially scrabble for vocabulary. Scrabble is my personal favourite! MINE TOO, Kimberly!! LOVE LOVE LOVE Scrabble. Don’t have anyone to play with face to face, so I play online and Facebook’s Words with Friends. Are you on Facebook? We should connect! Feel free to look for me! Good list of games. We do a lot of memory games! Thanks, Michelle. What’s your favourite? Pingback: Having Fun in our Homeschool AND Giveaway! Found your blog as part of the WD October Platform Challenge. As a fellow homeschool mom, thought I’d say “Hi” and introduce myself. I’m a veteran homeschool mom and taught our 2 kids from preschool age all the way up through high school-fun and challenging. Certainly reminds moms to have patience. I would trade that time for the world though. It was such a joy to observe first hand as my children learned, conquered difficult concepts, laughed and shared congratulatory high 5, etc. During that time, I created a LOT of original learning games and activities which eventually led to me being invited to write a column for Home School Enrichment Magazine. LOVE it! Anyway, my family and I live in eastern Pennsylvania in the countryside with wildlife galore! I like to read, write, watch old movies, garden, cook and bake, bird watch and go fishing with my sweetheart!! Wishing you continued success with homeschooling!! Thanks so much for visiting, Karen, and happy to meet you! Every stage the children go through is just awesome in its own right. YAY!! Thanks for visiting, Kimberly! And, yet another thing we have in common…fishing! Happy homeschooling, fabulous fishing and successful Scrabble playing to you!! !